November 26, 2018 (Ministry of Foreign Affairs) — Bilateral meetings ran concurrently with the panel discussions at the First Caribbean-UAE (United Arab Emirates) Cooperation Forum opened in Dubai at The Ritz-Carlton Dubai International Financial Centre on November 25, 2018. Hon. Mark Brantley, Minister of Foreign Affairs and Aviation and Premier of Nevis, had the opportunity to engage in frank and fruitful dialogue with Her Excellency Reem Al Hashimy, Minister of State for International Cooperation in the UAE’s Ministry of Foreign Affairs, on matters of priority to the Federation and of interest to the United Arab Emirates (UAE). Mr. Brantley reiterated the intention of the government of St. Kitts and Nevis to upgrade its Consulate General to an Embassy in Abu Dhabi by the first quarter 2019. This was welcomed news to the UAE Minister and she expressed her government’s appreciation for the gesture. The two ministers recalled discussions regarding the Visa Waiver Agreement and intimated their willingness to conclude this important cooperation initiative to foster people-to-people contact and more business opportunities. The UAE side requested clarification on a particular matter which should move the process to completion in the short term. Other areas for cooperation were explored including, but not limited to, alternative energy, specifically geothermal energy. Minister Al Hashimy expressed appreciation for the support St. Kitts and Nevis continues to lend to her country in the international arena. 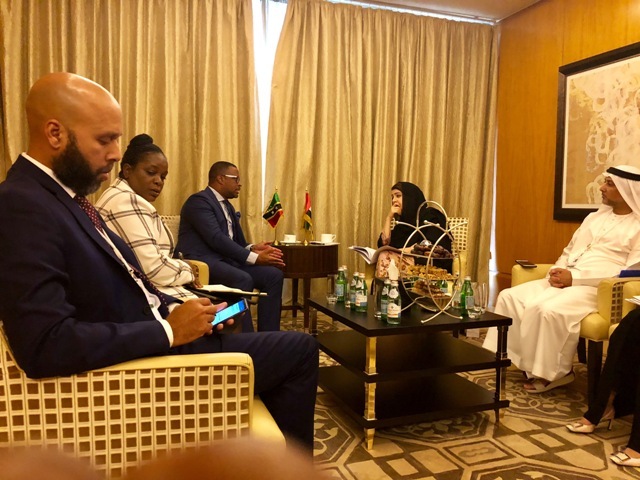 Minister Brantley seized the opportunity to congratulate Minister Al Hashimy on the advanced preparations her country continues to make as host of EXPO 2020, and expressed of St. Kitts and Nevis’ delight to participate in the global event due to take place in the beautiful and innovative city of Dubai. Accompanying the Mr. Brantley at the meeting were Ms. Kaye Bass, Permanent Secretary in the Ministry of Foreign Affairs and Education, Mr. Justin Hawley, Consul General of St. Kitts and Nevis in Dubai, and Ms. Elsa Wilkin-Armbrister, St. Kitts and Nevis Commissioner for EXPO2020.